Mixed with soil this specially prepared combination of peat and organic recycled materials will enrich the roooting area of new plants and thus encourage quick establishment. Contains a special combination of nutrients and water retaining agents that enable the fast rooting of roses, trees and shrubs. 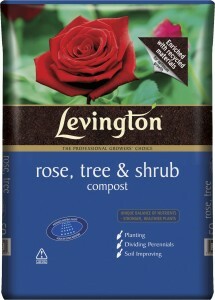 Why use a rose, tree and shrub compost? Rose, tree and shrub compost differs from standard multi purpose compost by having a lower pH level which is suited to growing a range of shrubs and plants.